This is a fun but disciplined fitness and Martial Arts class for kids aged between 6-14 years old who want to have fun, keep fit and learn self-defence. The South Coast Kickboxing club has been running for over 10 years under the guidance of 4th Degree Black Belt James Cowan, who has over 40 years experience in Martial Arts and has been teaching for over 30 years. The aim is to create a popular kids club in addition to the already well-established senior club. So why not give your boys and girls the chance to participate in a sport which is great for building self-control, discipline and self-achievement. 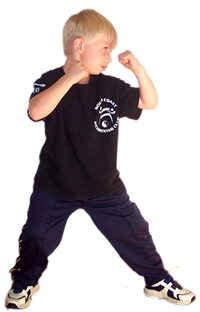 The club is registered with the Amateur Martial Arts Association and holds regular gradings, competitions and seminars. If you are interested, then just visit any class and give it a go! For further information, please contact James Cowan.